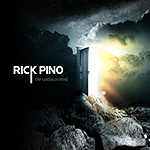 Rick Pino is the founder of Fire Rain Ministries, an established, covered ministry that is sent out by Apostle and Pastor Robert Summers and Mt. Creek Church in Dallas, Texas. Rick is a dynamic prophetic minister from Las Vegas, Nevada. The Lord is using Rick to set the church as well as the lost free through his deep, heart gripping music, prophetic words, and passionate messages.